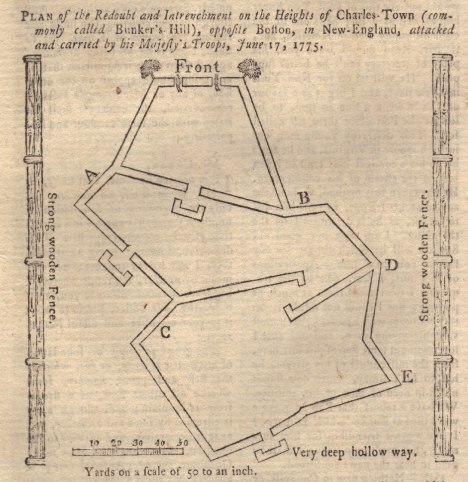 This complete September 1775 historic issue of Gentleman's Magazine contains a 1/2 page map of the "Redoubt and Entrenchment on the Heights of Charles Town, commonly called Bunker Hill, opposite Boston, attacked and carried by His Majesty's Troops, June 17, 1775." This engraving of the BATTLE OF BUNKER HILL was published within 90 days of the battle. There's nothing like history as viewed by people who lived during the historic event. 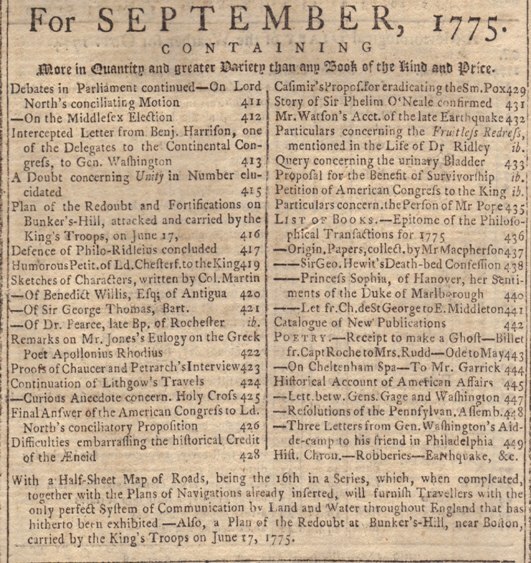 * a petition signed in type by JOHN HANCOCK titled: "Petition of the American Congress to the King." * lots of other news of military and civic affairs in America, including measures adopted by the Pennsylvania Assembly to oppose British aggression. Pictures of portions of these highlights are shown below, starting with the Index and followed by the wonderful John Adams letter to Abigail. 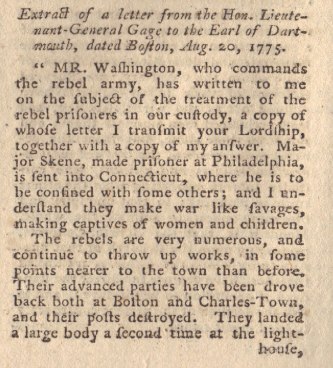 Below is the start of the long letter from Benjamin Harrison to George Washington and an excerpt reporting on Georgia joining the union of colonies. 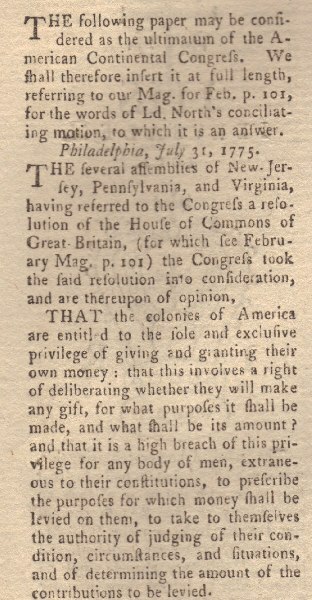 Below is the start of Congress' reply to the British compromise proposal to let the colonies pay the unspecified British taxes by whatever means they wish. 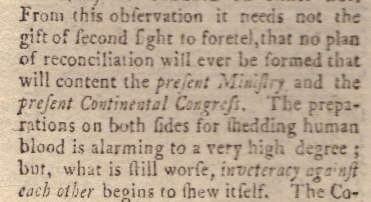 Also in this issue is a full text petition by Congress to the King requesting relief from the aggression of his ministry. 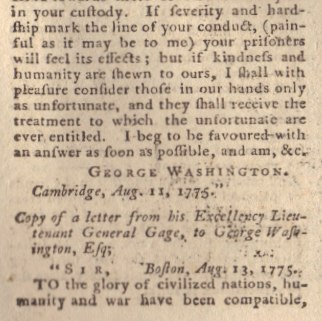 Below is the introduction to the two full text letters between George Washington and British Commander in Chief General Gage. 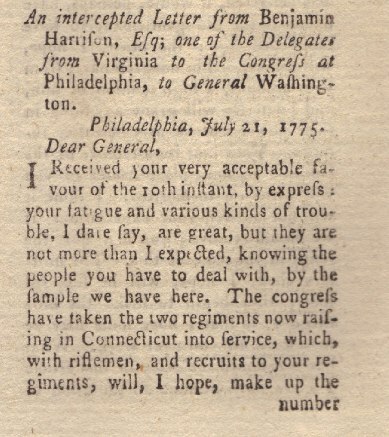 Notice the references to "Mr." George Washington" and George Washington "Esq." in an effort not to recognize his position as commander in chief of the Continental Army. Later, in 1776 in New York, Washington refused to received communications from the British addressed in that manner. Below is a commentary on the likely course of the conflict and a lamentation about the Loyalists in America who were having their Freedom of Speech curtailed. 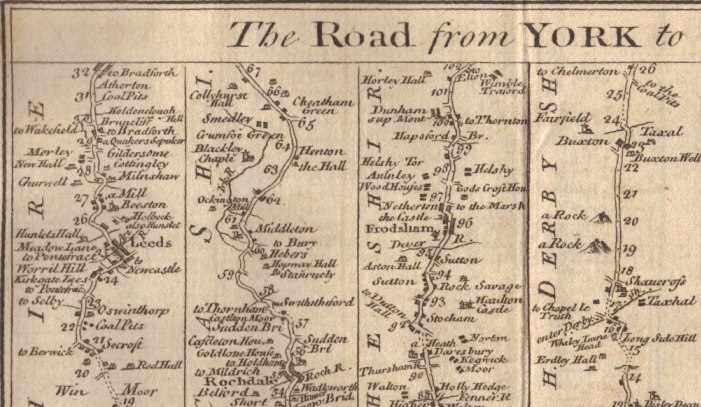 This issue is complete, including a fold out map of the road from York to Chester, Whitby, Scarborough, Lancaster, etc. This has one of if not the EARLIEST REPRESENTATION of the battle of Bunker Hill at the start of the American Revolutionary War and a great letter from John Adams, which alone are worth the price of this piece of history.